I first played Resident Evil not long after it had been released even though I had no idea what the game was about. 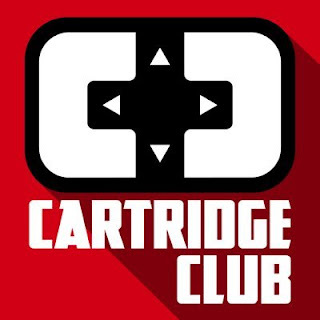 My friend Cole (now contributor here on Retro-Def!) and I rented it back when he first got his PlayStation and I cannot recall for the life of me why we picked that game. If you have seen the cover art for it, it is infamously bad - something Capcom is known for - but we did and I'm so glad, because Resident Evil has become one of my favourite games and gaming franchises of all time. It was developed by Capcom in Japan as Biohazard and directed by Shinji Mikami, who to this point had only done a handful of licensed titles, such as Goof Troop, Aladdin, and Who Framed Roger Rabbit? 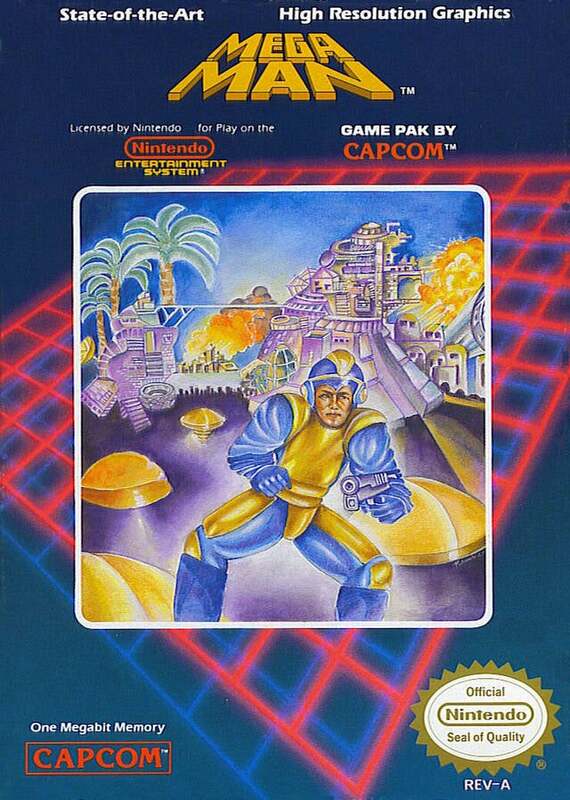 Mikami has said that in making Resident Evil he was attempting to make a game like Sweet Home, which was a Japanese only title released for the Famicom. As a horror movie buff, Mikami has also stated that he was dissatisfied with 1979's Zombie, directed by Lucio Fulci, and wanted to make a game with none of the failings of that film. Couple that with being heavily influenced by George A. Romero and his films, it is not shocking that he delivered a horror game featuring... the undead! 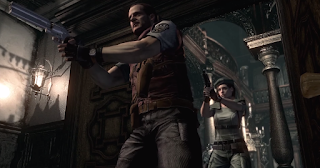 Resident Evil follows an elite specialized police force known as STARS (Special Tactics and Rescue Service) who are investigating some weird murders that have taken place in the small community of Raccoon City. 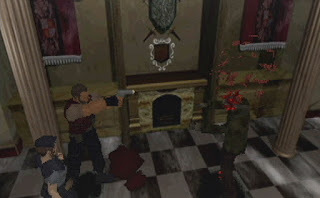 When communication with the STARS Bravo Team is lost, the Alpha Team is sent into the Raccoon City countryside, where the ground team is chased into an old mansion by a pack of monstrous dogs, ultimately losing contact with their helicopter. That is how the player finds them self in The Mansion, the main location for the rest of the game. You can play as two characters, Chris Redfield or Jill Valentine, each of which has their own storyline and some minor changes in gameplay. Barry and Jill taking on the undead! 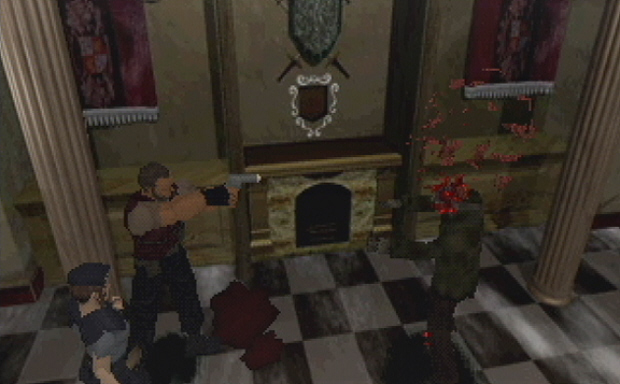 The character models are all in isometric 3D and the player traverses The Mansion in what have become known as "tank controls". 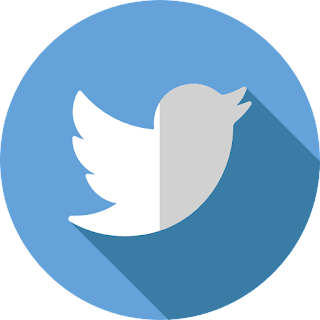 It can take a little getting used to, but once you get the hang of it it is pretty easy to use. 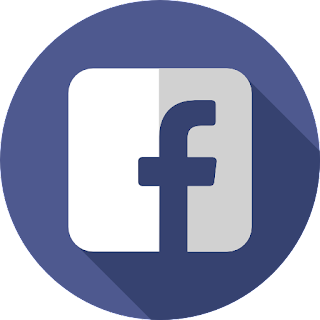 Essentially you aim the character in the direction you want them to go using the left and right directional buttons and then move them forward or backward by using up and down. 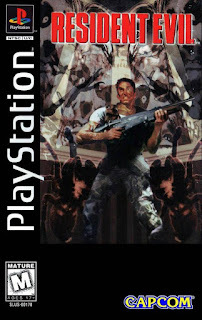 At the time Sony had not yet released the DualShock controller, which featured analog controls, but after that controller became available the game was re-released as Resident Evil: Director's Cut, which featured and Arrange Mode and DualShock controls. Honestly, though, they change nothing and I find it easier to use the d-pad. The main crux of the gameplay is surviving, which is why these games have become known as Survival Horror, along with Mikami being dubbed as the Godfather of the subgenre. You have very few items at your disposal and you can only carry a handful with you at any time. You slowly work your way around The Mansion, unlocking different rooms, searching for useful items, and fighting your way through zombies, giant spiders, and all sorts of crazy monsters. You can store items in special lock boxes that you will find strewn about The Mansion and you can save your progress on typewriters, as long as you've got some ink ribbons tucked away. You will find several different weapons, but remember that ammo is scarce and must be used sparingly! It is this scarcity of ammo and healing items that drives the tension and scares of Resident Evil. You never know what you will face around the next bend, nor what items you should have on you. The game features beats not unlike the ones you would experience in a horror movie. The music will sometimes drop in a room to keep you off guard for the next scare or you will be clicking away in a room looking for an item and a zombie will jump out of nowhere and attack. Resident Evil is the very definition of a slow burn. You will find yourself running circles around The Mansion and additional areas trying to find that one door you didn't unlock yet or that item you forgot to grab. It is not an action title, like the series has become. To truly enjoy it you have to let yourself get immersed in the setting and the story and take your time. When you do hit an action sequence, it is less about how many bullets you can pump into your opponent as it is just trying to make it out alive. The writing can be a little hokey and that is one thing that has always intrigued me about the game. The actual story itself is fantastic. It has grown to be something much, much larger than I'm sure Mikami and his team ever anticipated. The only person I know that can actually really wrap his head around the story in its entirety is Cole. That said, the writing and dialogue in this game is infamously silly at times. 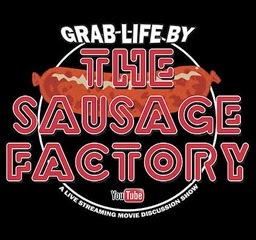 There are incredible lines like, "You were almost a Jill sandwich!" and "... you, the master of unlocking..."
I used to think this was just due to translation, but when you think about the influences of the game - campy horror films from the 60s and 70s - one starts to wonder if Mikami didn't do this on purpose to pay homage to directors like Fulci and Romero. The game even opens with a B-movie introduction that certainly hearkens back to horror films of that era. 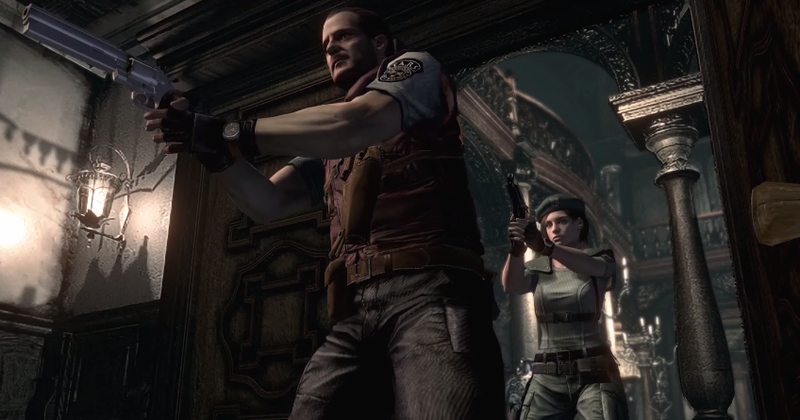 The Resident Evil series has gone on to be one of the most influential video game franchises of all time and is closing in on its 20th anniversary next year. The original game was actually remade for the GameCube in 2002, which was itself re-released and remastered on a number of modern consoles. There has even been a successful film franchise based on the property which is seeing its sixth title in 2017. I am not a huge fan of how the series has found itself in the action genre, but there are still compelling titles coming out under the Resident Evil umbrella (see what I did there?) and I am certain that there will still be great games to play in the future. 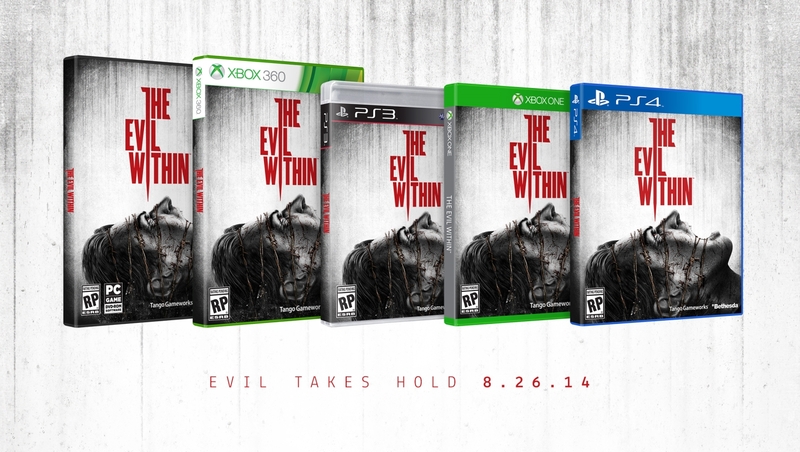 Shinji Mikami no longer has anything to do with the series. 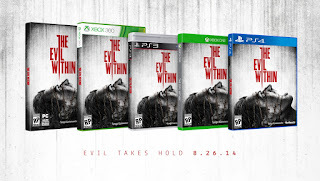 He has gone on to make new Survival Horror games, his most recent title being The Evil Within, which has garnered pretty high marks both critically and commercially. He is still out there trying to scare anyone that dares to boot up one of his titles. 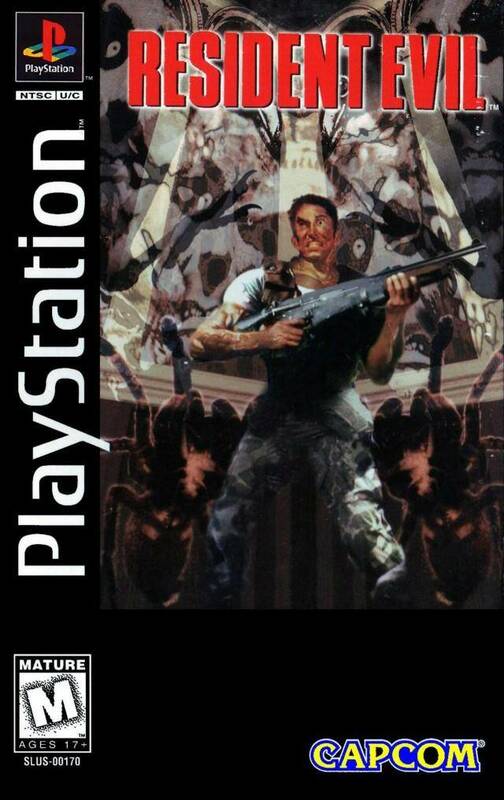 It all started with this campy little horror title on Sony's newest little fledgling system back in 1996 and although there have been many remakes and sequels I still think the original Resident Evil is relevant and anyone who likes to play video games should give it at least one play through.